I currently have a physical server being protected by the free agent. The current agent job is configured locally and stores its backups on a VBR repo. I have a 15 instance license but only 13 being used, so I understand I can allocate a spare license to this physical server. However, I can't find any instructions on converting a free agent to licensed. How can I do this? I'm running 9.5 u4. I'm not precious about keeping the backup chain. You should allow free agents to consume instances in the general options, please take a look on the existing topic here. Thanks! Have you changed the old instance license to the new one? You should do this in order to get new functionality. Thanks! Thanks. 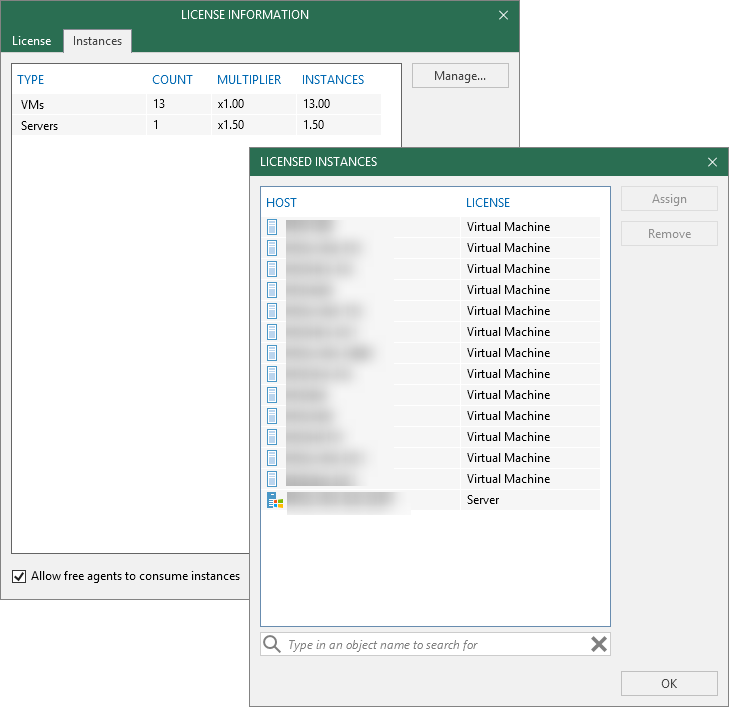 I went to the Veeam License portal and noticed the button to get the new license file for u4. Having downloaded that and applied I get, "Cannot install license. License key is invalid or corrupted". The license file contents look fine in Notepad. I will raise a support case and see what they say. Your license is valid, since it is working for VBR per earlier screenshot. Not trying to give a "Сaptain Obvious" advice .. but try downloading Agents from the website, it should work for the v3 version just fine. Since it doesn't work on your existing Agent, not sure how you upgraded it... may be useful for support guys to know. But if you can reinstall the Agent, that may be faster resolution for the problem. Ok, I'm embarrassed to say, I was only running 9.5 update 3a, not update 4, hence why the License screen looked different! Now upgraded to update 4 and all is well. Ok. Now I'm upgraded, I have another problem related to converting agents to free. As mentioned, I have two instance licenses free. I have around 5-6 free-version agents deployed - all backing up to a VBR repo. I want a specific physical server only to consume a license, but none of the other agent machines. When I tick 'allow free agents to consume licenses', and after the next backup job starts, this server pops up in the list and consumes a license. But so do the other agent-based-machines. I then get a warning on the agent-workstations that I don't have enough licenses. Enterprise Manager also shows a similar warning - that I don't have enough licenses. Could it be that with 13 VM's licensed, 1 physical server (consuming 1.5 license instances), I only have 0.5 licences left over, meaning the 'allow free agents to consume licenses' makes an agent get this 0.5 license then complain that it doesn't have enough. If I have 0 instances left over, would a free agent still complain that it cannot obtain a license? It should let you exceed licensed instances usage by 10% (or by 10 instances, whichever number is greater). Thanks! Nope. Here is a screenshot of how my licensing looks when I have just my 13 VMs and 1 phyiscal server licensed. Notice I have the 'allow free agents to consume instances' ticked. And here is a screenshot of me switching to another free-agent-based computer and manually kicking off a backup. The only way it seems I can get the remaining free-agent-based computers to backup, is to untick 'allow free agents to consumer instances'. However, when doing this, my 1 physical server I do want licensed also reverts to free. Am I missing something, or should I raise a support case? That's unexpected behavior, can you reach out the support team and provide the logs for review. Please share the case ID here, so we can track it internally. Thanks! BTW I noticed from screenshots that your agent is still 2.2, can you update to 3.0? Thanks! I have now updated the agents to v3 on two physical servers; one being my protected physical server that I want to license, the other is an unimportant physical server I want to leave on the free agent. (I still have a few other endpoints running 2.2 and will upgrade those this week). However, this hasn't helped; I can still see my protected physical server has a license (shown under 'licensed instances') and I can run that job from VBR console. On my free physical server, when I try to manually start the job there, I get the same error as before. 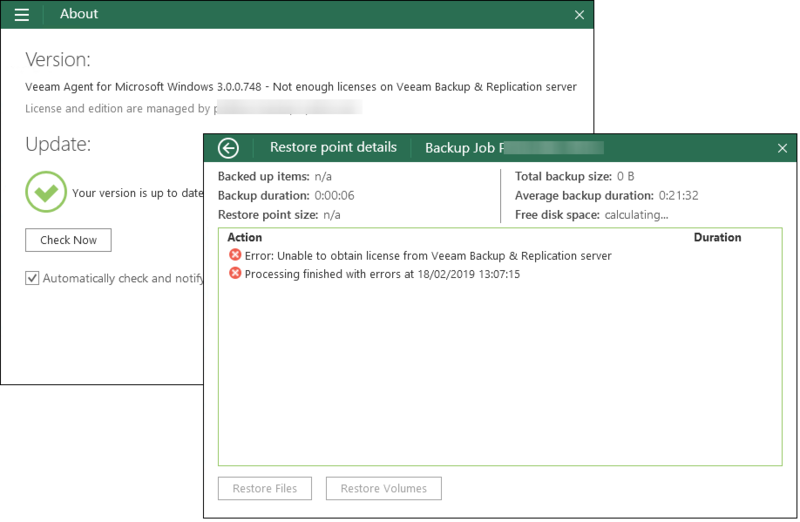 To keep this simple, Veeam Backup & Replication 9.5u4 is still unable to mix free and paid editions of Veeam Agent for Windows. And if that check box that says "free editions will consume the instances" we start to treat this as something akin to paid. You won't be able to have one machine take that instance and not the others. 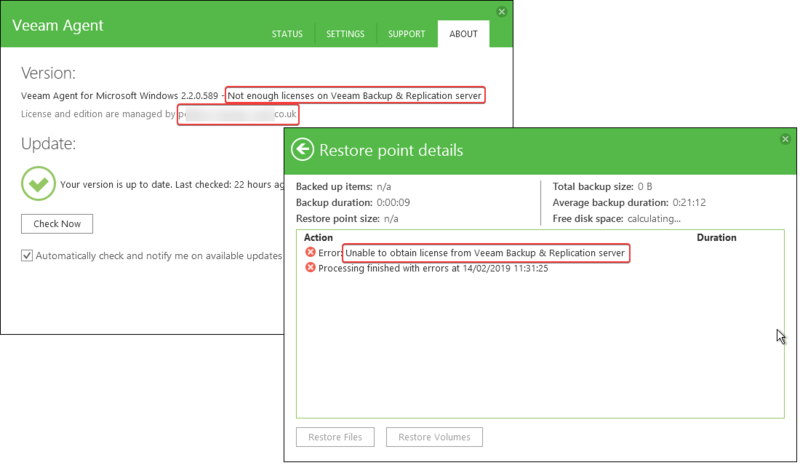 So in otherwords, for any machine that you would like to take over that instance, you'll need to have that as the dedicated Veeam server with the license. And for any free edition Agents backups, that will need to go to a separate B & R repository so that we're working with free edition. I'm not sure I totally understand that response. Particularly the last two sentences. Can someone elaborate?